Learn more about the work we do and take an in-depth look at specific projects! Drive through your hometown in the middle of any given weekday during the summer, and you are sure to see a number of different lawn maintenance trucks pulling trailers loaded with lawn mowers, trimmers, and blowers. Just in your own neighborhood, a dozen different companies could be hired by your neighbors to maintain their lawns throughout the season. Despite hours and hours of research to find and learn about our competitors, we constantly see trucks from companies about which we were previously unaware. To put it simply, when it comes to choosing a company to maintain your lawn, you have dozens, or even hundreds of options. Between large companies with fleets of over 100 vehicles, smaller companies with just a few employees, and even just a kid from down the street looking to earn some gas money throughout the summer, the number of options can be overwhelming. Here’s your guide to help you answer those questions and make a decision you will be happy with the whole summer long. When it comes to lawn maintenance companies, there are four aspects to consider: reliability, quality of work, company values, and, of course, price. We believe it is in every homeowner’s best interest to make sure they hire a company that knows what they are doing, works efficiently, and shares their values all at a price that makes sense. What good is it to hire a company that has low prices, but rushes to get the work done, and isn’t able to address your concerns and questions throughout the season? When beginning your search for a company, look online or around your neighborhood. Take a look at their online reviews and take the time to look through websites to learn as much about a company as possible! It is a good idea to pick three companies and give them all call or email. See how prompt they are at returning phone calls or emails. You want to make sure that if you have problems or questions down the road, you can be able to reach someone and get an answer quickly! Oftentimes, only one out of those three companies will answer the phone right away and the other two may even take a few days to return a message. If a company doesn’t respond quickly, you should immediately scratch those off of your list. Once you can find two or three companies that provide you with prompt responses, invite them out to take a look at your lawn and do a walk through with you. When a company’s representative arrives for an appointment, whether it be a manager, company owner, or crew leader, pay attention to how professional they act. Take note of how they’re dressed, how courteous they are, and if they came prepared with a clipboard or other necessary tools to diagnose the condition of your lawn and to take notes. It could be expected that they may have a little dirt on their clothes, given the industry, but a professional landscaper should have a uniform or nicer shirt with company branding. The idea here is to find someone that takes themselves and their company seriously. If they take themselves seriously, you can bet they take their work seriously and that they will have instilled that sense of pride in the crews who will be taking care of your lawn. Furthermore, it is important to know you have someone who is friendly and pleasant to work with and won’t make you feel as though you are wasting their time when you have any questions. Next, make sure you get quotes from more than one company to compare prices. After meeting with more than one company, there may be one that you like more than the others, but you still want to make sure you aren’t paying too much. Every company has a different way of estimating their lawn maintenance contracts. Some include other services such as bed maintenance and fertilization, others may have those as optional add-ons that aren’t included in the price. It is a good idea just to clarify exactly what is included so you know what you are getting. One company may operate better equipment that allows one to operate a little more efficiently than the other companies so their price may be lower for that reason, but it is important to realize that the lowest price isn’t always the best option. If a price is too low, a crew may be forcing itself to hurry and get the job done within a certain time to stay ahead of budget. This is something you want to avoid. Don’t be afraid to ask how a company comes up with its price. At the end of the day, it is usually your best bet to go with the company that impressed you the most over the phone and when you met them on your property. Every time you see that company's truck pull on your street, you will be happy you chose a company you feel good about! Pirc Company’s goal is to be that company you can feel good about. Every one of our employees is trained to put an emphasis on professionalism, reliability, and dedication to their customers. You can expect a Pirc Company lawn maintenance crew to show up on time every week, treat you in a friendly manner, and leave your lawn looking as great as it possibly can. We know how to treat our customers well because we force ourselves to think like they think. We firmly believe that when you give us a call, meet us in person, and see our crews cutting your lawn, you will be consistently impressed with the way we go about our business. Don’t let just anyone with a lawnmower cut your grass; you owe it to yourself to have a company you can count on week after week, year after year. When a new house is built, it often doesn't feel like home until the lawn is filled with bright green grass. Oftentimes, owners of new homes wait a little bit to start growing their lawn because they're overwhelmed with finalizing the construction of their new house, moving furniture, and making sure everything was built to their liking. What they may not know, is how quickly and easily a lawn can be installed using hydroseed. Hydroseed is a mixture of water, grass seed, and paper that is blended to a pulp and then sprayed onto fresh dirt to grow into grass. This is the most efficient way to grow grass for a number of reasons. First, since the seed is continuously sprayed, large areas can be seeded quickly and consistently. Secondly, hydroseed can be easily customized with any types of fertilizers, grass seeds, and nutrients to create a lawn that is best suited for a particular property. Finally, because the seed is mixed to a pulp, it sticks to the ground and protects itself - no need to throw down hay on top or risk any seed blowing away in the wind. Let's take a look at the process and see how its done! After seven months of construction, this house is left with rocks, dirt, and weeds around the whole property. The first step to a new lawn is to remove the rocks and weeds and level the ground. We had to add fill dirt to make the ground completely level. A skidsteer loader and tractor made light work of the task. After the yard was properly graded, we added some nutrient-rich top soil to accommodate speedy growth for healthy grass. When the prep work is complete, the hydroseeder arrives and our hydroseed technicians get to work spraying the lawn. A team of 3 people can accomplish the task in very little time. Typically, a foreman operates the nozzle and directs the rest of the crew to help guide the hose to where it needs to go. When spraying against buildings or concrete, the crew uses a board of plywood as a shield to make sure the seed only goes where it is supposed to. When the lawn is done being seeded, a daily watering is all is needed. After a few days, the grass will start to sprout. After a few weeks, the lawn will look quite full, but will fill out for a few months as grass blades start to grow in thicker and thicker. If done properly, with a good hydroseed mix, the lawn should grow in without weeds. A monthly treatment program will keep the lawn looking perfect year after year. Pirc Company Honors its Roots in the Cleveland Kurentovanje Parade! 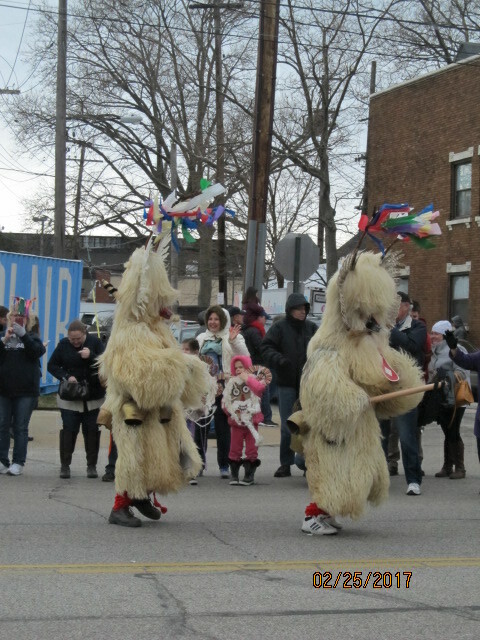 Over the weekend, Pirc Company celebrated its Slovenian heritage by participating in the Cleveland Kurentovanje parade! Kurentovanje (koo-rahn-toh-VAHN-yay) is a Slovenian Mardi Gras tradition in which furry characters, called “kurents”, dance through the streets shaking bells and rattles to scare away the cold winter and usher in the warm months of spring. We chose to participate in the Kurentovanje parade as a means to pay homage to the company owner’s grandfather, Anthony J. Pirc the first. Pirc was a proud Slovenian in his time and was very active with the Slovenian home in Collinwood. He holds a special place in Pirc Company’s history as the initial inspiration to his grandson, also named Anthony J. Pirc, to pursue a career as an entrepreneur in the landscaping industry. Young Anthony used to visit the Slovenian home with his grandfather on the weekends where they shared many good times and created lasting memories. The inspiration to be a landscaper came when Anthony was just six years old and his grandfather would let him cut the grass at his house. Entrusted with such a responsibility at such a young age, Anthony could not help but to feel a sense of pride and accomplishment when his grandfather admired his job well done. It is this pride in his work that has driven Anthony to grow Pirc Company into the business it is today. If Anthony J. Pirc the first could be alive today to see his name on 50+ trucks serving thousands throughout Northeast Ohio, he would certainly be one proud Slovenian. To have been able to share our company’s heritage with our employees and the Slovenian community this past Saturday is an opportunity for which we are incredibly grateful. Below are pictures of the float-building process, as well as some pictures from the "Kurent Jump" held the night before parade day! 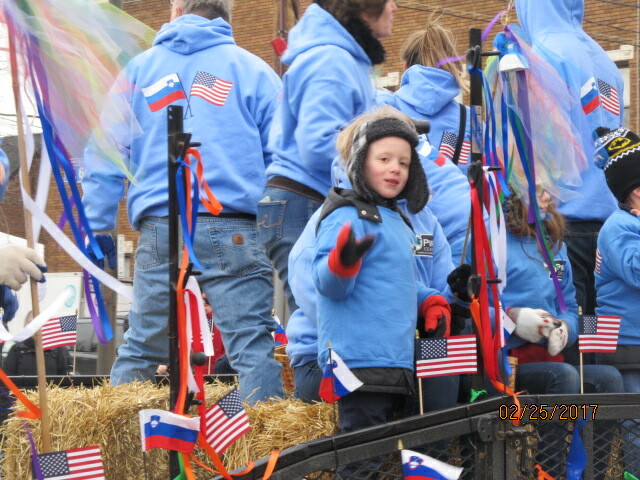 Everyone had so much fun at the parade, despite the temperature dropping to 38 degrees from 78 degrees the previous day. Happy Presidents' Day! Whether you are enjoying a day off of work or not on this holiday, chances are you will learn something new about one of our nation's presidents before the day's end. While there are many facts to learn and many interesting questions to be answered about our country's history, as landscapers, the first thing that comes to mind when the country takes a break to celebrate George Washington's birthday is "what did his yard look like?" Well, thanks to the internet, we quickly had our answer. Let's take a look! As we can see, our first president's mansion is quite beautiful and is a great example of the Georgian architecture that was popular throughout the 18th and early 19th centuries; a relatively symmetrical design, cupola atop the roof, dormer windows, a bold pediment in the center, and dual chimneys. The grass in its current condition is lush, well maintained, and one can assume that there isn't a single blade of crabgrass on the whole lawn. Despite all of these qualities, we are left wondering why there is almost no landscape design. As trivial as it may be scrutinize an estate of this significance and stature, we cannot help but to ask ourselves "where are the hedges, flowers, shrubs, and trees to tie it all together?" The art of landscaping and gardening has been around since ancient times and has always evolved to accompany the architecture of the times, so it would make sense for a home of this grandeur to have a landscape design as well thought-out as the house, itself. Since Pirc Company wasn't around in the 1700s to help Washington with his yard, for the sake of Presidents' Day, we thought it would be fun to to do so now and brainstorm a few design elements we think George would have appreciated. First things first, we think the large, circular patch of grass in front of the house has a lot of potential to add a little depth to the yard. Adding some simple trees around the perimeter of this grassy area would create a formal look that would greet Washington's guests as they ride up in their horse-drawn carriages. The picture to the right displays the elegance of neatly-trimmed trees. George would have to do without the light post, though, because Thomas Edison didn't invent the light bulb yet (I wonder what his yard looked like). As we continue moving toward Washington's front door, there is a patch of grass in front of each corner of the house. Here, we envision flowerbeds lined with hedges to keep things looking formal. We would add some color with flowers and maybe add a fountain in each bed just to keep things interesting. The trimmed hedges create a frame around the bed. The flowers and fountain make a bold statement! The last part of Washington's house we would like to address is his home's entrance. Currently, there are three doors and nothing hints as to which is the main door, though it can be assumed it is the one in the center. We want to highlight the center door and really make this part of the home the focal point. We would do this by creating a wide, brick walkway lined with plants along with a couple potted plants on either side of the door. A fancy design with the pavers will ensure a presidential look. These are just a few ideas we had from a few projects we have worked on over the years. We think George Washington would have liked our ideas just as much as our customers have! Every famous work of art, whether it be a painting or a sculpture has started from a blank canvas, a solid block of marble, or another form of undeveloped material from which an artist will create his masterpiece. Simply put, an artist works best when provided with the opportunity to start from scratch and has free reign to develop an original idea in his head and create something out of nothing. As landscapers, most of the projects we do are enhancements, additions, or modifications to an old landscape project that already exists. While we enjoy this challenge (and we think we do a pretty good job at it), we relish the opportunity to start from a blank slate and create something from nothing. Much like a painter would step back and look at a canvas and envision his painting, a new house with a fresh pile of dirt is all we need to get our creative juices flowing! The small flower pot on the front step is displayed as a sign of hope for this yard in its current state! To exemplify this scenario, two newlyweds who moved into a new house asked us to help them kick-start their married life with a new lawn and flower bed. After meeting with them and discussing their needs, we couldn't be happier to work with them on the project! Before the project got started, the front yard was nothing but a bunch of unwanted weeds. "Please don't damage the siding" is all we could think when we look back at this picture! At first it seemed it would be a daunting task to remove it all, but with the right equipment, we were down to the dirt in no time. Once the yard was cleared out, we were able to start focusing on developing our work of art and working toward the final result. Whenever we do a project like this, we start with the beds, and then do the lawn second. Once the ground was leveled, we put down a thick layer of fresh topsoil where the bed would go. Company owner, Anthony, spent some time orchestrating the process, but is never afraid to get his hands dirty, himself. Once we had the shape of the bed formed, it was time to pick out some plants and see how they would fit. The homeowners chose some simple plants that would be easy to maintain and wouldn't overcrowd the bed when they fill out. After adding a few boulders and finalizing the layout, we installed the plants, threw down some mulch, and got going with the next phase of the project. Once we had the bed finished, we couldn't wait to see the end result. All we had to do was lay down topsoil on the rest of the yard and then it was time for some grass! Using nutrient-rich topsoil is important for any new lawn. This is arguably the most important step of the whole process! Jordon preparing the sloped yard for the new lawn! The layer of topsoil is complete! Typically, when we install a new lawn, we will analyze the area to be seeded to determine which type of seed will work best as well as what type of fertilizers will ensure proper growth. Usually, we mix these materials together with water into a hydroseed and spray it on the dirt, but to speed things up for the eager homeowners, we agreed to search for sod that would work well for their yard. After a day of laying sod and touching up the project, the homeowners were thrilled to have a great looking yard that complemented their new home! As the plants grow, they will fill in the space nicely. Two arborvitae will frame the door while tree to the left will grow to about 10 feet in the next few years. Homeowners added their own touch with a few pumpkins! Today, millions will tune in to find out if Punxsutawney Phil sees his shadow or not. It may not be scientifically accurate to rely on a marmot to forecast the weather, but Groundhog Day is symbolic of the preparation that goes on behind the scenes at Pirc Company during this time of the year. When Phil sticks his head out of the ground, we cannot help but ask ourselves the following questions: "When is the right time to take the snowplows off the trucks? Are our lawnmowers in proper operational condition? Is our workforce ready for the warm months ahead and the work that comes with?" The transitions between snowplow seasons and the warm seasons are our busiest times of the year. As a landscaping and snowplowing company, we are constantly preparing months ahead to make sure our crews hit the ground running at the beginning of a season. While the town of Punxsutawney, Pennsylvania is celebrating the transition from Winter to Spring, our maintenance technicians are hard at work ensuring the lawn mowers are ready to go and our account managers are meeting with customers to set goals and expectations for the season ahead. Before we know it, our snowplows will be in storage and our fleet of lawnmowers will once again be in full force. As much as we can appreciate large, mature trees, sometimes they can get in the way. Here is an example of a beautiful house with neatly trimmed plants hidden behind three large evergreen trees. At one point, these trees were much smaller and served the house and its landscape well, but they have outgrown the yard and are taking away from the property's curb appeal. 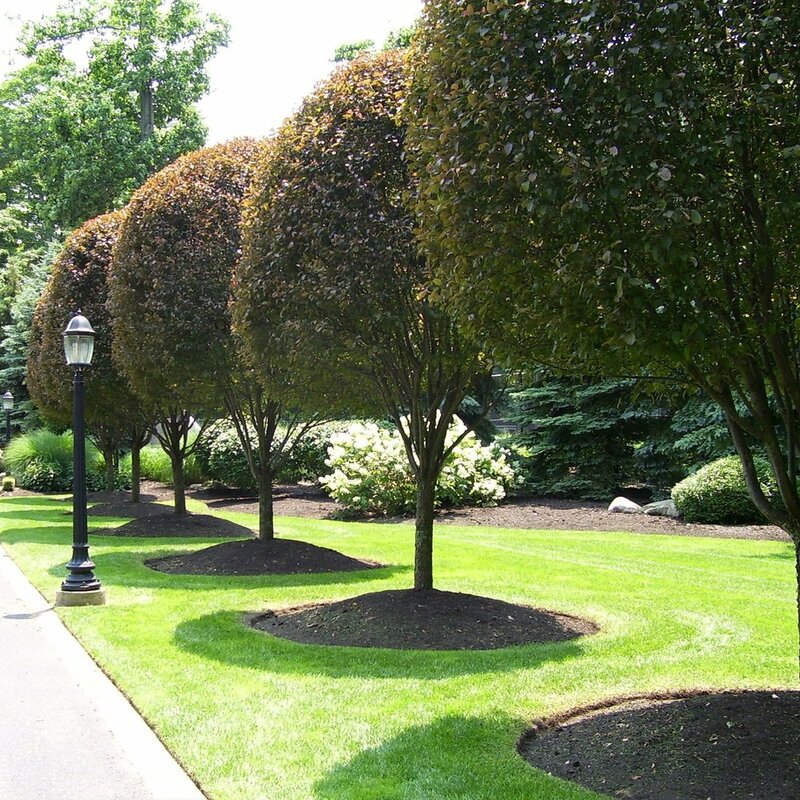 The customer recognized that the trees needed to go and called Pirc Company to take care of the job. Once the trees were removed, we met with the homeowner and drew up a plan to fill the newly empty space with an attractive design. To take advantage of the sloped yard, the customer agreed it would be best to build a retaining wall to create a dramatic, three-dimensional effect. To ensure a durable wall that will last a lifetime, we used Versa-Lok stone blocks, a premium building material that looks natural and is built to last. The homeowners wanted the wall to compliment the house, so we added a layer of red blocks to tie in with the red brick house. After the wall was completed, we topped off the project with a young tree, several large natural stones, and some fresh mulch. Overall, the design is simple, classic, and will stand the test of time. Furthermore, it truly compliments the house and dramatically increases curb appeal. The final result is one that the homeowners can be proud of for years to come!